Design Concepts is a leading commercial printing company and provides a complete range of printing services including electronic pre-press, up to five-color printing and post-press capabilities. Paper Stock : Premium Executive Bond / German D.O. 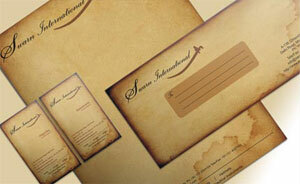 text white Bond paper or standard 90gsm Superprint text white paper stock. Do you need Design assistance? We can help you layout your Stationery from your design files, or we can design the entire project based on your supplied content. Email the details of your request for pricing.